Certain plants consistently get top billing in the nursery trade. They’re talked up by sales reps and they reliably land at the top of profit spreadsheets. Usually, these stalwarts live up to industry and customer expectations because they perform well and satisfy needs in the home garden or commercial landscape. But once in a while, something comes along to outperform or outsell these major players. To slide an industry standard even a few notches down the sales scale, a new plant must have an improvement that sells. As a cacophony of choices rain down from breeders each year, inventory lists grow longer and more complicated. Higher prices often push buyers right back to the dependable-but-sometimes-boring plants that better fit the budget. Why mess with a standard? You can always make money from landscapers who order hundreds of Arborvitae, Photinia or Spirea. Destin Brown, Northwest sales representative for Fisher Farms, is of two minds. From a retail standpoint, with a little marketing, flashy new plants practically sell themselves. But when it comes to hydrangeas, the market has something very different to say. Arguably the biggest breakthrough in plant breeding in decades is the repeat-blooming hydrangea, a story that started in 2004 with the first ‘Endless Summer’, which would launch a Bailey brand that no one will dispute revolutionized the hydrangea market. Obviously, the Endless Summer series gets the public excited, as well. It’s one of Bailey’s best sellers and there’s no end in sight, especially with the 2014 introduction of ‘BloomStruck’, a repeat-bloomer of dark purple or pink depending on soil. Sales projections for 2016 are impressive, Jackson said, and will eventually surpass ‘Endless Summer’. It’s in cases like the Endless Summer series that Brown agrees the landscape contingent might jump on the bandwagon. Too many people will holler for them and innovative marketing gives these relatively new plants an edge. Contractors also gave the nod to popular Knock Out® roses when their value became undeniable. But when Bigej started back in the 1950s, Knock Out roses weren’t even a fantasy. Instead, petunias were on the precipice of taking the annual market by storm. Only three washed-out colors existed: ‘Fire Chief’, ‘Celestial’ and ‘Pale Face’. For decades petunias made grand strides: more saturated colors, ruffled flowers, larger flowers. And then came the trailers. But then came budworm and no one wanted to spray. Instead growers moved toward crops of impatiens until powdery mildew took a huge monetary swipe at that crop. 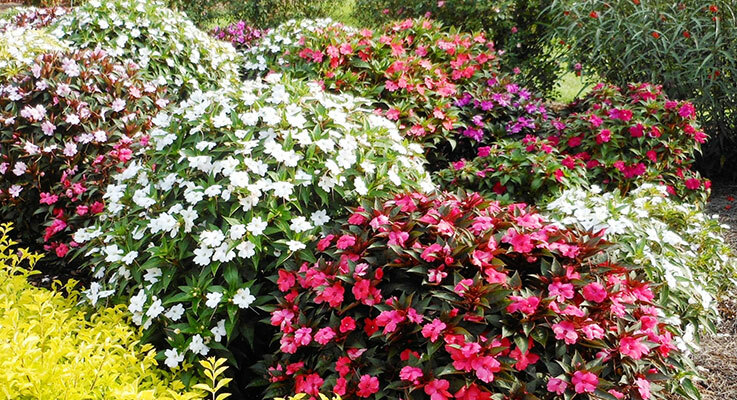 Now, Bigej said, SunPatiens® are the annual on the verge of becoming the new standard. When it comes to adopting new plants, designers like Darcy Daniels of Portland enjoy the best of three worlds. She works with clients in small urban gardens, larger suburban gardens and her own, where she’s free to try whatever catches her fancy. And as much as she admires the newest and coolest on nursery shelves, Daniels will not turn her back on the bread and butter of gardening. Daniels adores good, old-fashioned Fatsia japonica. Still, the hype in the breeding world draws the attention of Daniels and her colleagues. What’s new? What’s cool? What’s going to make it in my client’s garden? Like many designers, their clients and by extension others in the nursery industry, Daniels is invested in the native craze and becomes particularly keen when an improved selection like ‘Pacific Fire’ vine maple (Acer circinatum) comes on the market. Daniels also has her eye on Little Quick Fire®, a dwarf of Hydrangea paniculata ‘Quick Fire’, a hardworking, early-to-bloom plant that starts out white, turns pink and ends its season rose. With 450–500 trees under production at any one time, there’s a lot more than ‘Pacific Fire’ going on at J. Frank Schmidt out in Boring. In fact, the nursery is celebrating the 50th anniversary of Red Sunset® Maple. It’s the most widely sold Acer rubrum in the country and perhaps the world, according to Nancy Buley, director of communications at Schmidt. “But it’s had its day,” she said. So the search started for a better red maple, one that grows faster, has a stronger central leader and is more upright. After poring over thousands and thousands of seedlings grown in the nursery, one rose to the top. It took 17 years from the time seed was sown, grown, trialed at 30 sites across the country and then finally introduced in 2006 as Redpointe®. Since then, it’s surpassed Red Sunset in sales. Out of the same breeding program came columnar Armstrong Gold™ to replace the industry standard ‘Armstrong’. Back at Bailey Nurseries, Jackson recalled a similar story. He’d grown up yawning at his neighbor’s Hibiscus syriacus. What’s the big deal? he wondered. Yeah, they’re pretty when they bloom, but it’s only for a few weeks a year and they take up a lot of space. Then in 2012 Bailey released the Island series with ‘Bali’, ‘Tahiti’, ‘Fiji’ and ‘Hawaii’. One of Bailey’s top-selling plants is their shrub dogwood. In 2012, a new one called Baton Rouge™ (Cornus alba ‘Minbat’) joined the nursery’s First Editions® brand. The compact 3-by-4-foot shrub with green foliage, white flowers and bird-attracting white berries is nice enough, but it isn’t until the foliage takes its leave in winter and the twigs turn a screaming red that the show really begins. Sounds like a new standard in the making.